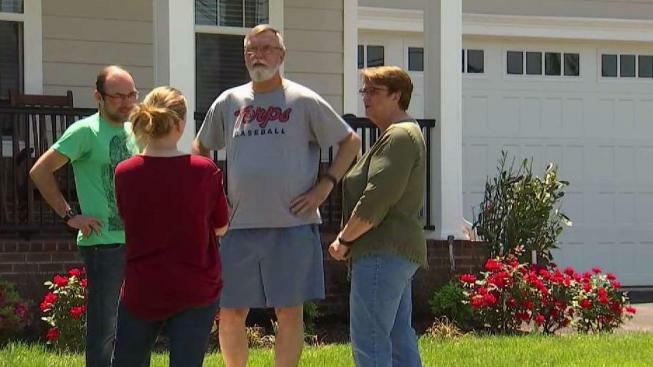 When a man had a heart attack as he mowed his lawn in Virginia, his neighbor helped save his life -- and a firefighter helped him and then finished mowing his lawn. Paul Hoffman is relatively new to his neighborhood in Leesburg, Virginia. Everyone in the new, partially completed development is. But one of his new neighbors helped him when he needed it most. Hoffman was mowing the front lawn on Sunday, May 20 when he suddenly collapsed. "[It was] just like a window shade was pulled down, and I went down, and that's all I remember," he said. The son of his neighbor Brandon Sutter saw that Hoffman needed help. "My older son grabs my arm and says, 'Mr Paul's laying down,'" Sutter said. He called 911 and the operator asked if he knew CPR. As luck would have it, Sutter had just taken a refresher course in CPR at his church. With coaching from the operator, Sutter breathed life into his neighbor as medics were on their way. "Within three minutes of that, we were on the scene and had been able to take over," a member of the Leesburg Volunteer Fire Company said. Medics rushed Hoffman to a hospital. Doctors there told him that if he had not gotten immediate help from his neighbor, the outcome could have been different. When Hoffman collapsed, finishing mowing the lawn was not on his mind. But when he returned home, he found that the whole lawn had been mowed. He and his wife figured that Sutter, the neighbor, had finished it, but he said he hadn't. It turned out a volunteer firefighter finished the job, another member of the fire company said. The firefighter runs a landscaping company, his firefighting shift was over and he figured, "Why not?" "It all boils down to customer service, is kind of the way we look at it," the firefighter said. Hoffman said he got emotional as he tried to thank Sutter. "How do you talk to someone and say, 'Thank you for saving my life?'" he said.